Hans Andersen celebrates the Elite League title success in 2006 with Panthers fans. 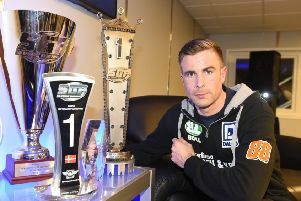 The Danish star returns to the city club as skipper following their rise into the SGB Premiership for 2019. Andersen is already afforded legend status in these parts after his heroic captain’s contribution in the Elite League title success of 2006. But, 13 years on, he is hopeful of delivering more memorable performances and leading Panthers to more silverware. And he believes that the club’s ultra-fast Alwalton base, which has undergone an overhaul from Panthers owner and much-respected track curator Buster Chapman in recent days, can be a huge factor in how their season pans out. “I’m keen to getting going now,” said Andersen. “It was great to get a few laps in yesterday on a track I have always loved. “I had some of the best times of my career while I was a Peterborough rider and the track here was a huge part of that. 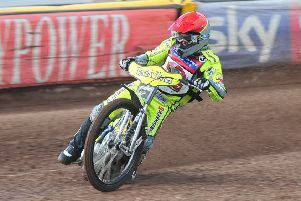 “It doesn’t matter who you are - you don’t score points around Peterborough without a fast bike. “It’s one of the real racetracks and there are very few occasions when I’ve had a bad meeting on it. “Riding well and winning races around here gives a rider so much confidence and being part of a successful team is also great. “Hopefully both of those things will happen this season as it’s so important to me to enjoy my racing. Despite the shock exit of former GP racer Craig Cook yesterday, Andersen believes Panthers posses the quality and experience to be successful home and away. He added: “I had a really good run of making the play-offs until I finished bottom with Leicester last season. “Our aim is to get into that top four and I feel sure we are capable of doing that. “We have a lot of guys who go well around our place and plenty of us also know the away tracks well.